Baking and cooking during life after college graduation. While Laurel spent hours comparing shades of rose pink – they vary heavily from brownish to orangish to reddish, I’ve learned – I gathered up all of the candy recipes I had been dying to try. 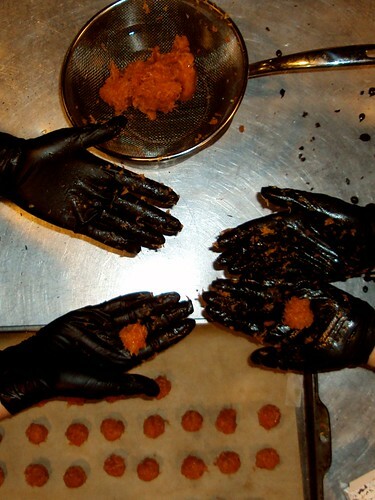 I knew one thing: I wanted to try my hand at enrobing truffles. 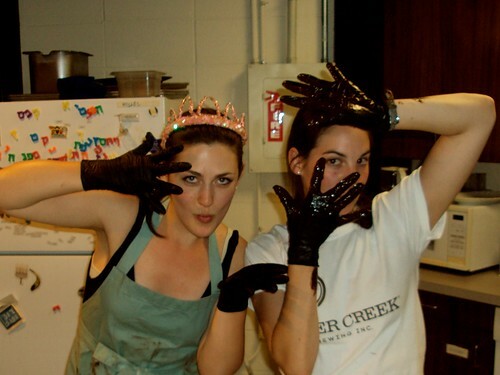 My experience with tempering chocolate was limited – I made some candied orange peels and chocolate covered cherries over winter break. They turned out beautifully and I had no trouble with achieving that shiny, snappy chocolate coating. “What’s all the fuss about?” I wondered to myself then. 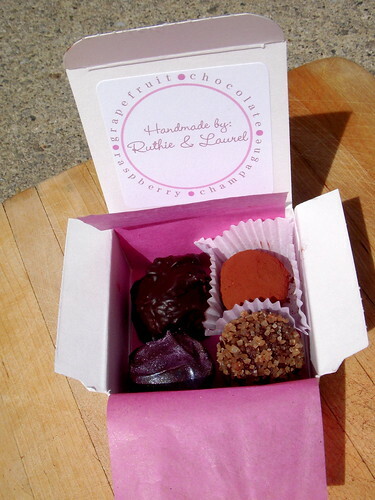 Laurel’s inspiration for this project was the discovery of Martha’s Champagne Truffles. Champagne. How appropriate for graduation. The recipe also had cognac in it. 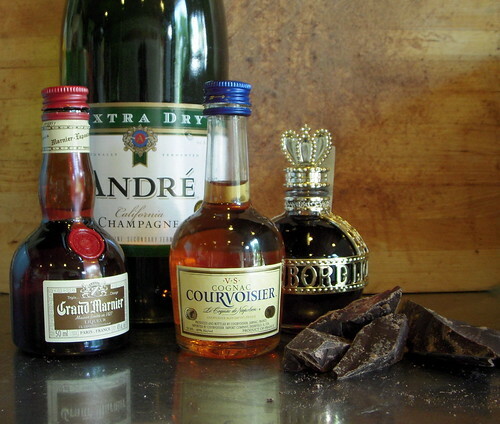 When starting this project, we weren’t even sure what cognac was. Other than highly alcoholic. We figured that, being college students, alcohol would be a good theme for our little presents. As such, we decided to complete our gift box with: basic chocolate truffles (with grand marnier), raspberry truffles (with chambord), and candied grapefruit (…ah..well..this one doesn’t have any alcohol but we’re big fans of Absolut Ruby Red, if you’d like to know). Day Two: Make ganache. A lot of it. A whole lot. 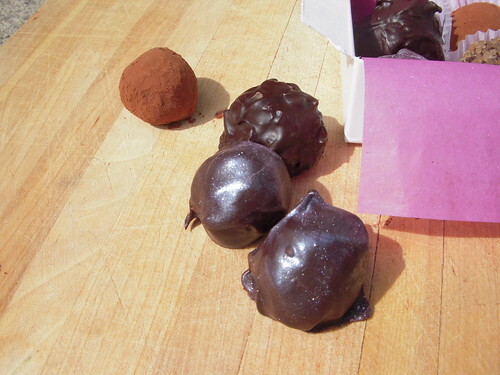 Roll some truffles that night, if ganache sets. Day Three: Fix anything that has gone wrong so far. Roll more truffles. ENROBE. Day four: Luster dust and package. On Day One our problems started. For further detail outside of the problems with the food itself, see Laurel’s post below. First of all, we did something weird to the grapefruit. Maybe we over boiled it? Either way, it seemed a little…strange. Not the texture we were hoping for. We crossed our fingers and hoped it would dry nicely. “We’ll just double coat it in chocolate if it’s too weird,” we figured. Weirdness can always be forgiven if there is enough chocolate involved. Problem #1: Solved! That evening as we began to enrobe, Laurel pulled out her thermometer so we could temper properly. As I inspected it, I realized that it was a candy thermometer and therefore did not accurately show temperatures low enough for chocolate melting! Who could we get a cooking thermometer from on a college campus? No one. Luckily I have some connections in the science department. Because we didn’t want to actually put any lab thermometers in our food, we borrowed the temp gun for a couple hours (measures surface temps when you point it at things). While I would NOT recommend this tempering method for anyone else, it’s all we could do at the time. We got a little loopy, though… Problem #3: Solved…mostly. Of course, the temperature gun didn’t work all that well. Luckily we had planned for tempering problems, and so our two tempered chocolates were going to be: a lumpy texture or luster dusted, both of which do a decent job hiding temper imperfections. 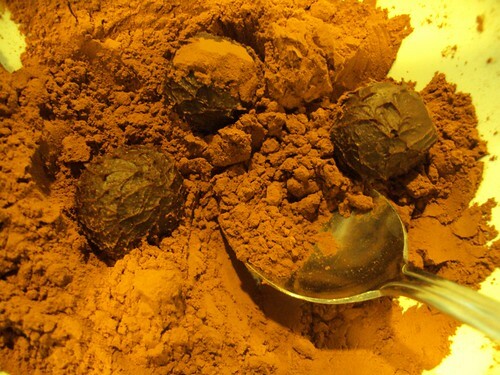 Our other two chocolates would be rolled in cocoa powder or coarse sugar. Problem #4: Hidden! Despite these minor speed bumps, the truffles came out beautifully and they were very much appreciated by our friends and mentors. Make ganache with cream, chocolate, and butter. Stir in chambord, raspberry jam, and pinch of salt. Chill until firm. Enrobe and luster dust. And of course keep a nice supply of extra chocolate for enrobing or any other problems you may encounter. If all else fails, please remember: You have a lot of chocolate at your hands. Relax and enjoy.